The HJ-23NP is a double hinge anti-static joint that makes two parallel pipes around each other. This connector is mostly used to build folding tables, doors, and other movable modules with an almost full 360-degree radius. This range can be reduced quickly by obstructive pipes. Be sure to plan your design to take advantage of the full radius capacity or to enable just a specific range of the hinges. Even if the HJ-23NP allows you to build similar modules to the ones using the HJ-12NP, the circumstances of application for the two is not the same. The fact that one allows the rotation of parallel pipes and the other of perpendicular pipes makes them useful in very different setups. Like the HJ-12NP, this joint will slide on the two pipes if you don't immobilize them. Sliding the H-23NP is sometimes a good thing but may not always be what you want. We recommend that you check the tips and tricks section of this product page to learn how to immobilize the connector and when to do so. 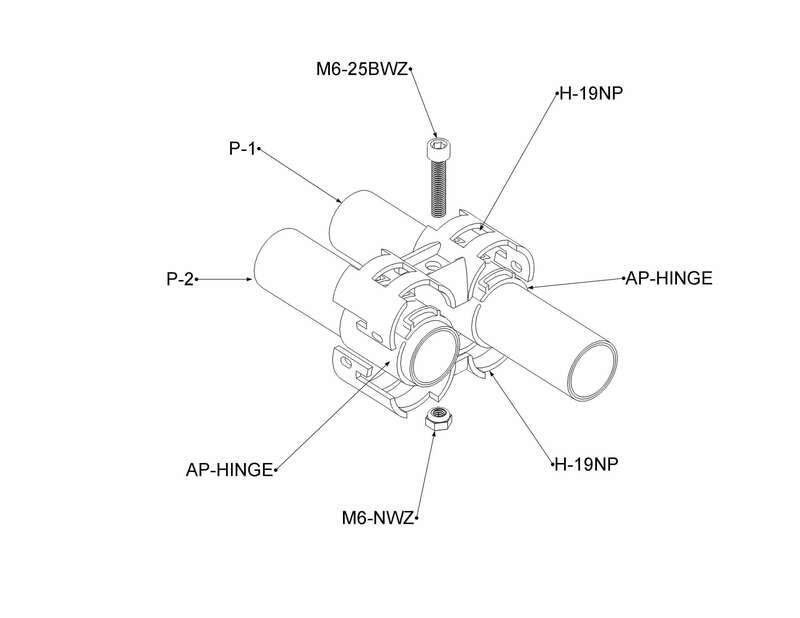 To assemble an HJ-23NP, you need to assemble two H-23NP around an AP-HINGE with one M6-25BWZ bolt and one M6-NWZ nut.